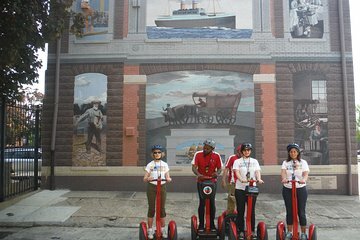 Scopri i quartieri più artistici di Filadelfia come mai prima d'ora in questo tour Segway guidato di 2,5 ore in piccoli gruppi. Scopri il meglio dei numerosi murales di Philly, dalla Città Vecchia alle Libertà del Nord, Spring Garden e Chinatown, e scopri di più sul Programma di arti murali della città di Philadelphia. Sono inclusi l'allenamento Segway guidato, cuffie e foto del tour. Indossare abiti adatti alle intemperie con scarpe piatte e chiuse. I took the mural tour with Barry. He was so knowledgeable and has such a passion for art. It was such a blast!! I'd do it again in a heart beat!! So much fun and incredibly intresting to learn about the city. Love, love, love it!!! Great tour. Lots of fun and great art work. Tour guide was extremely knowledgable and enjoyable. Great fun! Guide was knowledgeable and entertaining! Definitely recommend this tour. Everything was terrific, thanks, Owen! This was a great tour. My wife and I really enjoyed Barry our tour guides passion and enthusiasm for what he was showing us. It was more fun than I expected and highly recommend it. Worth every penny. My wife and I will do this again and will recommend to everyone try it at least once. Thanks again.